The Framers Forum • View topic - A finish for the more experienced framer. A finish for the more experienced framer. Tortoishell...This example is is red shell which is perhaps more used on frames than other colours. This is in my opinion, the best way in achieving a real tortoishell effect that actually resembles "shell". It can be cut shaped sanded just as you might do with a thin veneer and I have often used this effect (different coloured shell) within the Interior design environment as well as many Dutch Old Master flower paintings combined with ripple moulded timber as depicted (which I make at home),in the frame featured. I do not use the shame "shell" pattern, this is never the same as each piece is handmade. The examples show one finish of a single piece of shell under different grounds. As with most finishing processes, the skill is in keeping it thin in order for the ground to enhance this effect and to show the effect. I hope a few framers/finishers have a go at this effect. Re: A finish for the more experienced framer. I once did a tshell frame by accident. Was doing a woodgrain effect by using an orangey basecoat and a dark brown wash which was meant to be wiped and dragged. I put the wash on and something interrupted me. when I came back the wash had all beaded up on the surface and dried in blotches. It looked quite good so I waxed it. I've done similar ones since using a squirty bottle. it doesn't so much look like tshell but has the look of it if you get my drift. where do you get the shell from? I know what you mean Prospero, sometimes these things happen by accident and end up looking very pleasant. Would like to see an image if you have one? Some of the tortoishell finishes using either oil or acrylic scumble glazes etc, can look good and nothing wrong doing anything this way. Scumble works very well with a host of effects especially marble. Meant to mention on your previous post, I like the balance in how you have presented the display, putting the photo at the top, rather than the bottom, to my eye, makes it work very well. No Timh, not from the beach, wish it was that simple. I make the shell effect using clear film as you can see from the image. The effect is then worked onto the film thinly so it's opaque as in the example and applied over a profile or used depending on the need. Looks very good under a gold ground or metal leaf. You get a lovely glow from the finish especially if situated near a direct light source. Have a go! "You know, there's a right and wrong way to do everything!" Interests: Cycling, walking, darkroom photography and laughing a lot! Wow it looks brilliant, I like it a lot! Making just that little bit of difference to someone, somewhere. Nice effect Prospero and being of those shades, I can imagine ( around the right sort of art) it being very complementary. It's not tortoishell of course but the effect you have achieved nevertheless, is a good one. Have you used this one or other similar colours since. Dont know if you have tried oil scumbles, enamel varnishes etc, but on a gesso sanded profile they can look very good and would lend itself well to the effect you have achieved. Happy Easter everyone! I really like these finishes! Being fairly new to this please could someone explain what an "oil scumble" is? Thanks a lot, and Happy Easter to all. "Industry without art is brutality." - John Ruskin. As you rightly observe Geoff, it's merely a nod towards tshell rather than an attempt to imitate it. For 'arty' subjects it's best used sparingly. Narrow inlays such as this can be very effective and lend a richness to a frame. Having said that, I have never used it in anger . A full width finish like the sample would look great on a mirror frame. For fine art stuff it's too in-your-face. I think of mirror frames as furniture though . 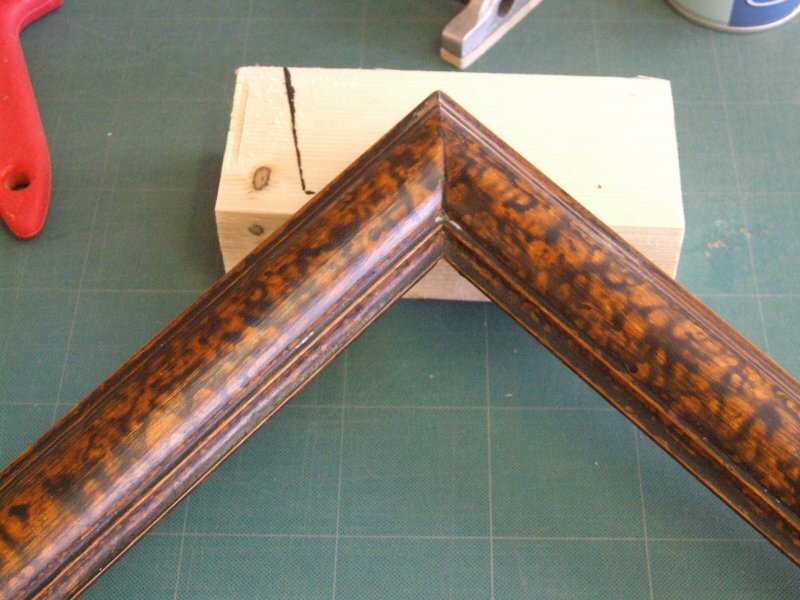 These days, tortoise shell finishes are quite a rarity, but as a classic victorian frame finish it wonderfully evokes an historic period feel, I have produced faux tortoise shell finishes for customers and remembered that there was a very helpful picture of a tortoise shell finish in one of Peers Feetham's books. Since I could not have access to a genuine tortoise shell finish, I had to rely on copying the picture in the book and was not completely sure how well it represented the real thing. However the customer was totally delighted, so need not have worried. Later, I was able to see and handle a real tortoise shell frame in a local auction and was very pleased to see how realistic my own version turned out to be. I'm currently teaching two friends (both forum members) some handfinishing skills and techniques, during evening get together sessions. So, I'm wondering if they will want to learn to do a tortoise shell finish. If so, I'll do a photo for the forum. BTW, I am fortunate to own copies of both of the Peers Feetham books and can thoughly recommend them to anyone wishing to add good framing books to their own collection. They are both long out of print, but they do turn up from time to time, if you keep an eye out for them. Yes Mark, The books you mention are very interesting and another I find myself looking at more these days, is one by Jenny Juracek simply called: "Surfaces". You might well have heard of that one. I too have many samples of "real" shell, one being particularly large. Yes t/shell has it's limitations and as mentioned I have used it on many Interior design projects, lots of mirrors and on quite a number of Dutch old master paintings. I have a good reference of the shell itself which I usually work from as a guide. As on my initial post, I like to have a separate shell that I can handle as in a real one and cut, shape etc to whatever is needed. I use diacel film for this and apply the effect to one side of it. This is then laid over a profile a piece at a time so one is butted up to the next. This adds a very realistic "shell" effect as you can imagine. Once completed around the profile or profiles if several sections are needed, I sand these back which again gives an impression of "worked shell". Usually I polish (thinly) the whole synthetic shell which gives a wonderful finish and if placed over a gold leaf ground you end up with a beautiful glow coming through. Lots of different coloured shell can be made of course. I have used other methods in achieving this effect in the past as you describe too. not entirely sure what I am doing wrong here, are you supposed to leave the head on? Interests: Films ,music and art, my wife and kids are pretty cool too. Like your sense of humour !!!!! !, not as good as "finglongerer" but close. Oh, and well done to Prospero and Geoff on your spooky finishes. Organisation: Considering the options. Again! Interests: Changes on a daily basis, but I'm never without a book to read. A few more recent things. Dutch Old Masters, failing that a Sid and Nancy photo.